Family heirlooms, antique pieces and all manner of historical furniture, toys, cars, scooters, motorbikes, statues and memorabilia not only look great and make for interesting centrepieces, they also often hold great sentimental value and treasured memories. At Bundaberg Sandblasting we often get clients coming in who are not sure if it is worth restoring that old 1950’s cast iron outdoor setting or treasured family heirloom back to it’s original glory. Can you get something like this anywhere else today, and will the quality be anywhere near as good if you go out and try to replace it with something new? The answer is often “No” and the quality and sentimental value of a restored item always makes the investment worth it. Because after 18 years of restoring and preserving all types of metal and timber items we have found the old saying… “They don’t make them like they used to” to generally ring true. But to bring your vintage and collectable pieces back to their original state requires great care and skill. At Bundaberg Sandblasting restoration and preservation is more than just work, it is a passion, and breathing new life into old items then seeing the faces of our clients when they see the finished product is one of the great joys of our profession. Each project requires proper planning and care to ensure the final product looks and functions just as it did the day it was made. This starts with disassembling the item back to its raw parts. We then strip and clean every part, removing all dirt and old paint using the state of the art PBM Dry Strip method. This is a damage free stripping method. For brass items we use a special Vaqua Blasting technique that is gentler and effectively cleans without removing any of underlying metal or substrate of softer metals. Once the item is stripped back and thoroughly cleaned we then colour match the new paint to the original colours that would have been used during production. Of course you can choose any colour you like if you have some creative ideas. 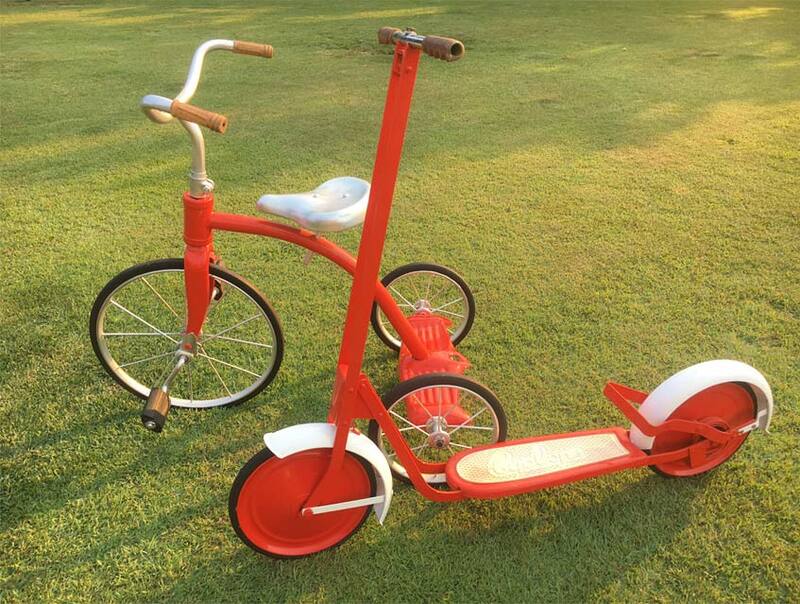 Once the parts are stripped cleaned, repaired and painted we then reassemble the finished item. To get the very best finish requires strict attention to detail and care through all steps of the restoration process and ensuring we use the right techniques and materials for the job. If you have a family heirloom, old furniture set or any type of vintage or sentimental object that you’d love to restore please give us a call on 07 4153 6089, contact us using our enquiry form or visit us at our office. We’ll be able to give you an upfront quote and we will care of your item as much as you do. What Is Corrosion & Why Does It Happen? In simple terms “Corrosion” is the breakdown of materials caused by their interactions with the surrounding environment. We generally associate corrosion with the breakdown of metals and over time the corrosion of all metals is inevitable. The chemical make of a particular metal will determine how susceptible it is to corrosion, which is why it’s important to choose the right metal for the right application, and also use the right protective coatings. To better protect metal assets from corrosion we need to first understand why corrosion occurs. In nature most metals are found as compounds with other elements. So to obtain pure metal (the oxidized state) steel mills will separate the metal from the other elements by adding energy. The different types of pure metals are then often combined with other compounds to create the materials we use to build cars, planes, bridges, and buildings, such as steel and aluminium. Through the process of oxidising these mechanical, engineering and building materials, they become very susceptible to corrosion due to the low stability of the metallic state. As an example newly made steel will become covered in rust in just a few short hours if protective coatings are not applied. To obtain pure metal from the earth we must add energy. 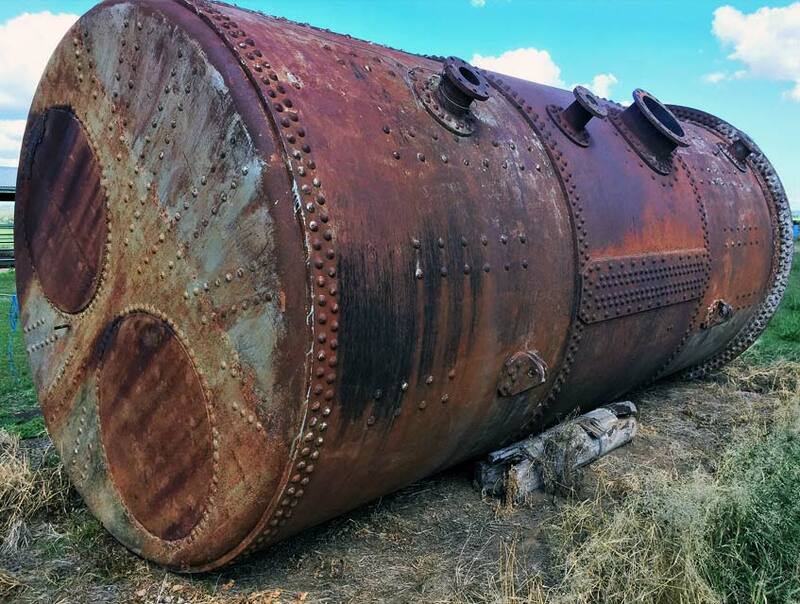 Corrosion occurs when the metal begins to release this energy after oxidizing agents in the environment trigger a chemical reaction, the most common oxidizing agent being oxygen. So if oxygen (and other elements) cause metal to corrode you must have the right protective coating to reduce corrosion and increase the lifespan and quality all metal materials otherwise they will deteriorate quickly. Choosing the right protective coating for your assets is crucial to maximising its lifespan, quality, appearance and functionality. Depending on how and where the materials will be used will determine the ideal protective coating. At Bundaberg Sandblasting we specialise in asset protection, particularly those made of steel and our highly trained team can help you get the perfect protection for any material. From bridges, machines and buildings, to antiques, bikes and cars. If you have any questions about corrosion protection please call 07 4153 6089 today and our NACE 2 Certified Coating Inspector will happily answer your questions and explain the ideal solution for your situation. For many years Wet Blasting (also known and Dustless Blasting) has been used as a way to control the dust generated from Abrasive Blasting. But the now outdated Wet Blasting machines and techniques still used by many companies have a lot of critical drawbacks. The term Wet Blasting simply means that a “wet ring” apparatus is secured to the end of the blast nozzle, with water flowing from the wet ring into the stream of air and abrasive. But this gives the operator very little control over water flow and air pressure, causing many issues with the finished product. There is also the major issue of unskilled operators adding an inhibitor solution to the water to decrease the “tea staining/flash rusting” issues we mentioned above. Generally this results in a thin film being left on the surface prior to Protective Coating application, especially if the concentration of inhibitor is incorrect. This often decreases the life expectancy of coatings, caused by adhesion issues when the remaining film of inhibitor solution and the protective coating do not combine. Also, with standard Wet Blasting, if the incorrect Protective Coating/Primer is then applied over a “tea stained/flash rusted” or damp surface, a definite failure will occur prematurely. At Bundaberg Sandblasting we now offer a cutting edge blasting process called “Vapor Blasting” or “Mist Blasting”. This unique process is much more effective, efficient and environmentally friendly, leaving you with the best quality surface finish every time. Our cutting edge Vapor Blasting machines allow us to adjust air pressure from 30 PSI through to 140 PSI. Minimal abrasive is then added to this stream of air, to which water is then injected at 1800PSI. By the time this makes impact the abrasive has a “vaporising” effect leaving you with the highest quality surface finish. Another major benefit of Vapor Blasting is that it uses less than 3 litres of water per minute, which is a huge water saving when compared to “Wet/Dustless Blasting”, which consumes between 20-40 litres per minute. 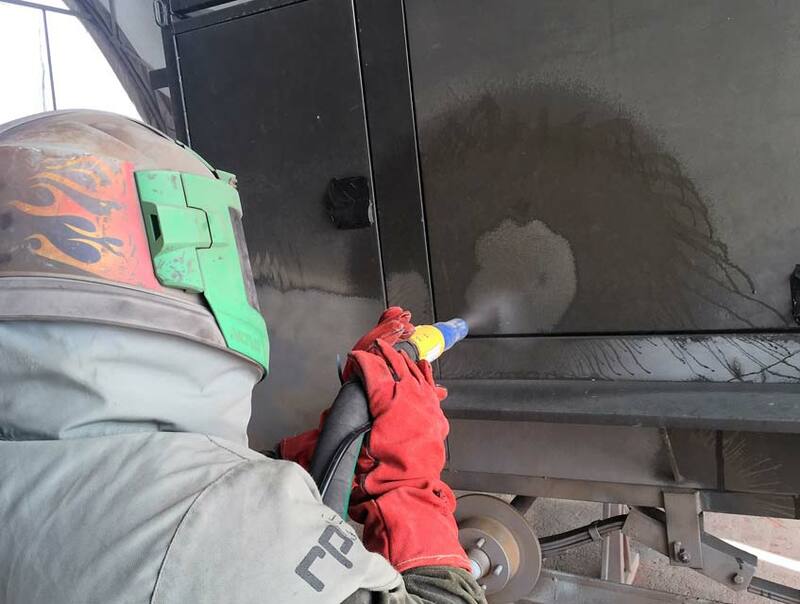 Also the amount of Abrasive consumption for “Wet/Dustless Blasting” is approximately 300-500 kilograms per hour, which is not only wasteful but leaves a huge mess to clean up at the end of a long hard day. “Vapor Blasting” on the other had gives you much more control over abrasive consumption, which can be as little as 50 kilograms per hour. This means less abrasive product impacting on the surface, and little mess and clean up at the end of the day. Can be used with Garnet, Bi-carbonate Soda, Crushed Glass, Glass Bead and Nut Shells for different removal process. As you can see there are many reasons why you will enjoy a much better finished result with our cutting edge Vapor Blasting solutions. To find out more about services and ask any questions you may have please Contact Us or call 4153 6089. Please click the button and fill in the form with details of your project and we will get back to you within 24hrs. Since first opening our doors in 1997 we have delivered thousands of successful projects and built a reputation as Queensland’s most reliable, experienced and friendly Abrasive Blasting, Spray Painting and Protective Coating Specialists. Our large state of the art facility along with our highly trained, qualified and dedicated team allow us to meet the needs of a wide-range of clients. We listen carefully to understand the finest details of your project then offer expert guidance, recommendations and fair upfront quotes so you can choose the solution that best fits your needs and budget.